In a medium size bowl, combine the strawberry slices with the sugar. The sugar will draw out some of their juices to make a tasty syrup in the bottom of the bowl. Cover and chill until the Angel Food Cake is cool. Prepare Angel Food Cake Mix according to package directions, but gently stir rainbow sprinkles into the batter right before you put it in the 10" tube pan. Bake and cool according to package directions. To serve, cut the Angel Food Cake in half horizontally. Put one of the bottoms, cut side up, on each plate. Spoon the strawberries and syrup over the top. 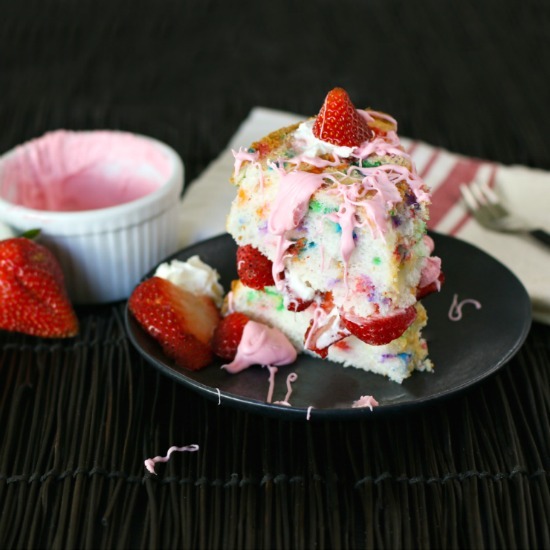 Place a spoonful of whipped cream on top of the strawberries. Set the other half of the cake on top, cut side down, and drizzle some frosting over the top. Serve immediately. 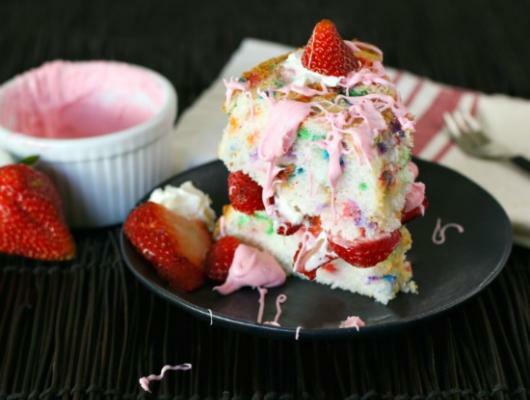 Strawberry Confetti Cake is piled with sweet berries, strawberry marshmallow frosting, confetti angel food cake and whip cream.